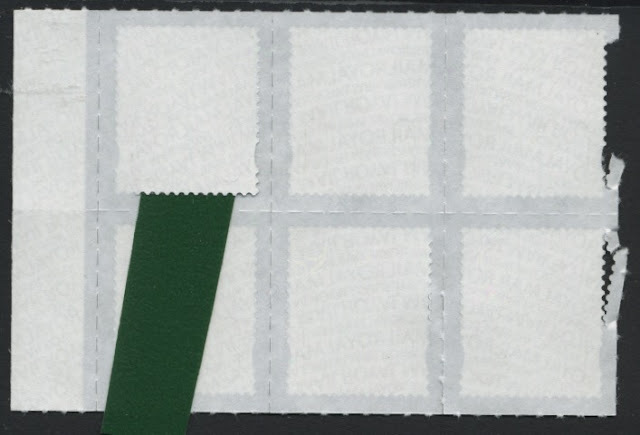 Since the printing of counter sheet stamps switched from De La Rue to ISP Walsall, there has been a marked change in some of the backing paper used, and the effect of the die-cut perforations. As I couldn't sell the date block with this fault, I started to split the sheet to store in the stockbook and - even though I had double folded the sheet along the rouletting - it separated down the perforations as shown at the right. I'll use these for postage, as they can't be sold either. The first sheet I noticed this on was the 100g Special Delivery, which is an expensive sheet to mess up! Fortunately I was able to use some of the unsaleable stamps on international tracked orders, so those customers had a bonus of a my using a brand new high value stamp on their postage. So the word is, take care!